You need to have an account to download the software. Register a free account here. Then login and download the software installer here. Our server software is called ScreamDB. 1. Run the downloaded installer on the Windows system you want to install the software. Windows SmartScreen might prevent the app from running. 2.If this is the first time you install ScreamDB then you probably want to install all components within the installer. Make sure that you check all boxes and then click “Next”. 3. During the installation you will be required to enter the customer name and password that you specified when you registered your account. These credentials will not be verified by the installer, so make sure that you enter them correctly, or the services will fail to connect after the installation is complete. 4. You will be asked to select a port number for the XMPP server. Make sure that you select one that is open for incoming traffic within your network. After the installation is completed, you will need to configure the system. This is done using the ScreamDB Configurator application. You will find a shortcut on your desktop. Note: All components connect to the XMPP server (ejabberd) with their own usernames and passwords. These are preconfigured and the server should only accept local system-component logins, so there is really no need to change them. 1. The first things you need to configure are the communication settings. 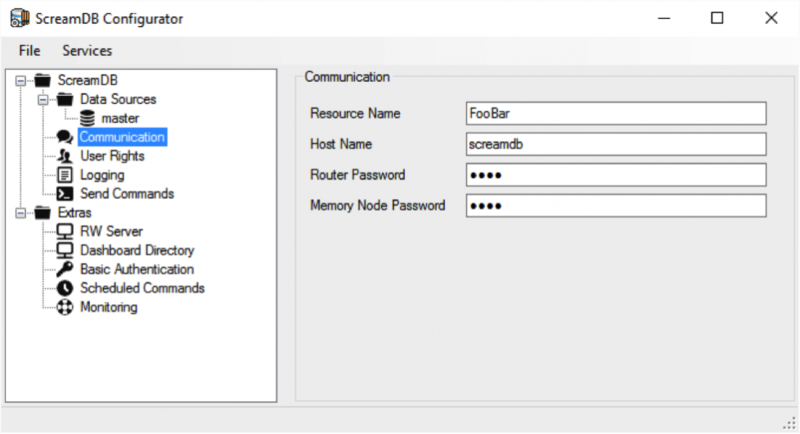 They are used by the core components (the router and the memory node) in ScreamDB to connect to the XMPP server (ejabberd). The default hostname will work so there is no need to change that. The only field you need to edit right now is the resource name. This name will be displayed in the client application (Dashboard Studio) for the end-users when they connect to the server. You can pick any resource name that you like, but the name will be stored within the dashboards that you create for the server, so make sure that it is one that want to stick with. Note: No changes made in the Configurator are saved automatically. To save them, you need to click File -> Save in the applications main menu. Most changes herein requires a restart of its related services/components. This can be done through the Services section of the main menu. 2. The second thing to configure is the master data source. This is where your data will be stored and served to the ScreamDB Memory Nodes, which is our data caching technology. The master data source needs to point to an existing MSSQL, PostgreSQL or Oracle database, and the user needs to have write access to the database in order for the system to create the required tables. 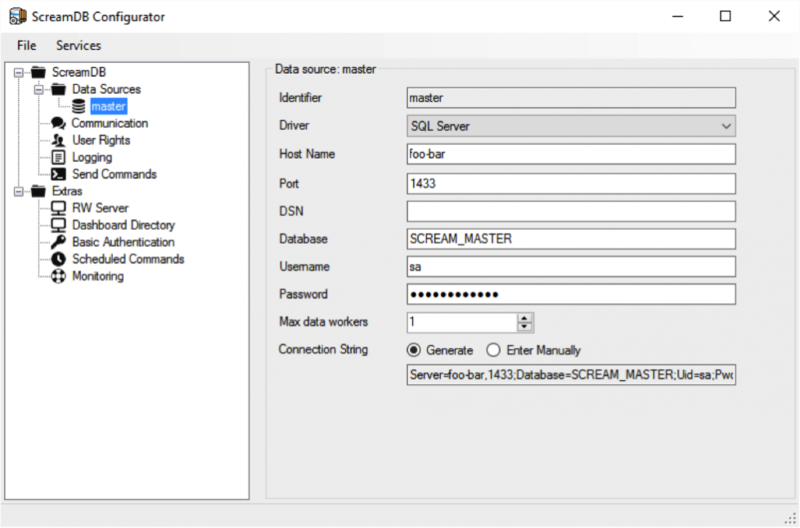 The Configurator will not remove any existing tables and if the database was previously configured to run ScreamDB, then the system will simply use the existing tables and not create any new ones. When you click File -> Save the Configurator will try to access the database with the credentials you have supplied and might ask you if you want to configure the database if it hasn’t been used by ScreamDB before (selecting “yes” will add some tables, views and procedures). 3. You have now configured the required components of the system but you need to restart some services before the changes go live. Inside the Configurator, there is a menu item called Services from which you can restart the components of the system without having to go through the windows control panel. Click on Services -> ScreamDB -> Restart All, and then Services -> Extras -> Restart Dashboard Directory. Your system is now ready to accept connections from Dashboard Studio. 4. Dashboard Studio is the web application from which end-users view and manage their dashboards. Upon logging in, our servers will verify your credentials, and then hand over the address to your server which it then connects to. Since that address most likely resides within your firewalls and is inaccessible to our servers, you need to configure this address manually in the customer configuration part of our website. Exchange foo-bar with the domain name or IP address of the server that has ScreamDB installed and the edit the default port number (7070) if you changed that during the installation. You can always verify that the address works by typing in the address within a web-browser on a client computer. Ejabberd should then reply with a minimal status message, letting you know that it’s up and running. You will also need a username and password for each user who will be using to the system. Users can be added and edited under the Customer section of our website. If you don’t want type in your customer name every time you log in, you can append /a/your-customer-name to the url, like this: http://app.digrealtime.com/a/your-customer-name and then bookmark that.